I think one of the hardest gardening tasks is thinning out seedlings. It is too easy to just let it go, because you are so excited to see the plants growing, and then everything is an overgrown, tangled mess that you can’t thin out. That’s one of the reasons that I try really hard to space things out when I plant the seeds. However, that doesn’t always work out. 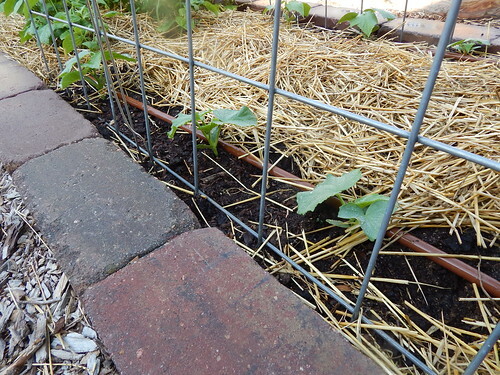 On our trellises for growing vining vegetables, we usually want no more than 2-3 plants per side of the trellis. It seems like so little when you are planting just a few seeds, but planting too many can be a disaster later on! You can see that there are at least 5 plants along this trellis, and I think there may have been another one or two that I didn’t get in the picture. Even though these plants will be growing up the trellis, if we left all of the plants in place, they would be so thick that we could have problems with diseases – especially if this hot, humid weather keeps on. We removed all but 3 plants from each of the trellises, which will still be plenty thick by the time the plants are full grown. 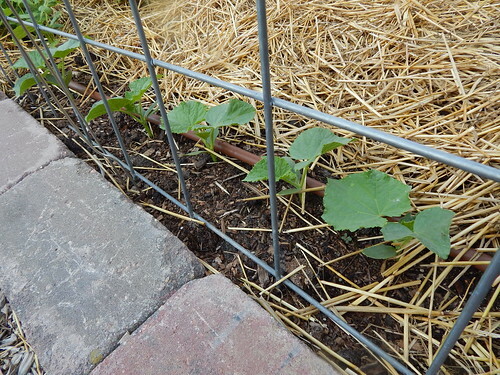 Posted on June 4, 2014, in Around the Garden, Techniques to Try and tagged cucumbers, melons, pumpkins, vertical garden. Bookmark the permalink. Leave a comment.